Touring Cars come to Knockhill this weekend and for the home crowd there will be another Scottish driver to cheer on. Lining up alongside Flash Gordon and Dave Newsham in the premier tin-top series will be 16-year-old Aiden Moffat, the youngest ever driver in the British Touring Car Championship. He will drive a Finesse Motorsport-run S2000 Chevrolet Cruze this weekend, but also involved in the move is Kirkcaldy’s Jonny Adam, the ex-BTCC and current GT driver who will test the car this week ahead of the youngster getting his mitts on it on Friday. Aiden, from Dalkeith, started karting at the age of 12 and also did a bit of junior banger racing in 2010 – ideal prep for Touring Cars? 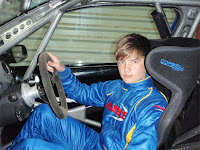 In 2012 he contested the Motorsport News Ford Fiesta Junior Championship racing at Silverstone, Brands Hatch and Donington Park and took his maiden car-racing win in the final race of the season. He is also competing this year in the Celtic Speed Mini Cooper Cup as well as the Scottish Ford Fiesta Championship in 2013 and will continue to do so alongside his BTCC commitments for the rest of the campaign. He’s had a recent pole position in the Cooper Cup and has won the last four races in the Fiesta ST Cup. At 16 years, ten months and 28 days he will become the youngest ever BTCC driver this weekend – a record previously held by 12-time race winner Tom Chilton.